If you're a frequent reader of our blog, you know that I'll often waffle over something for a while before buying it. 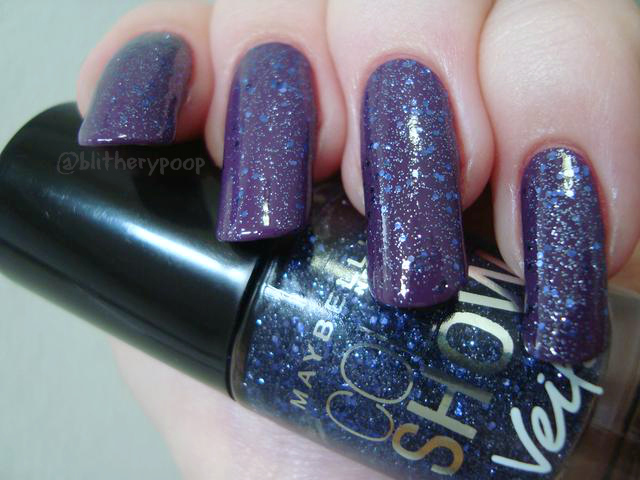 I've been looking at Maybelline's Color Show Veils, a new line of five toppers, literally all summer. When Nichole and I met up and wandered around a few shops back in July, we perused a Veils display at Rite Aid. We agreed that I'd probably hate Teal Beam, and I set it back down. Thing is, I kept picking it and the rest up and looking almost every time I saw them. Part of my hesitation was the word "textured" in the display. I found out that they aren't and my willpower started slipping. When my favorite CVS got the Fashion Rocks display, I had coupons and they had a sale. The tipping point was reached and four of the five Veils came home with me. A quick note here, before the review really starts. These aren't limited edition and should be showing up in the Maybelline core displays at big box and drugstores. 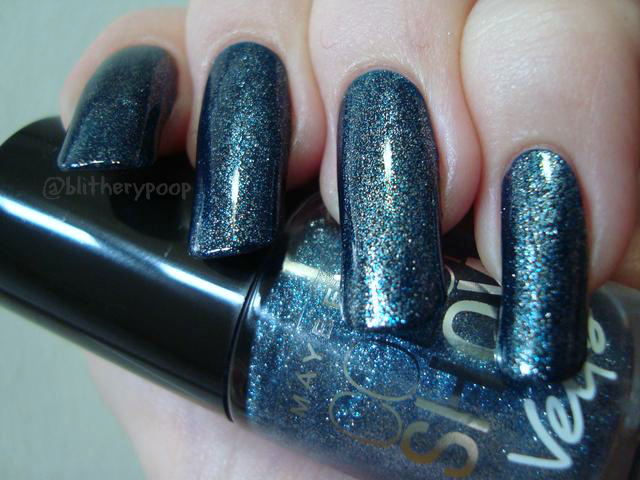 Teal Beam has gold shimmer and sparse pastel blue and green microglitter. Sometimes I challenge my taste in polish. It generally fails, but sometimes it's a big win. I'm very pleasantly surprised by Teal Beam! 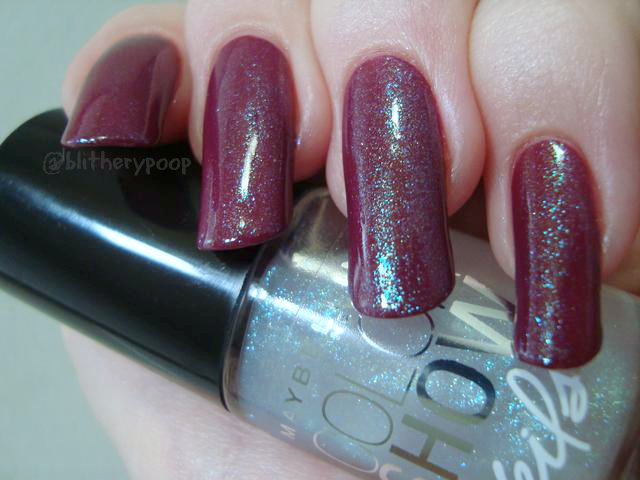 I'm not crazy about "Floam" style glitters, which is why I hesitated. Then I realized that this isn't like them at all. 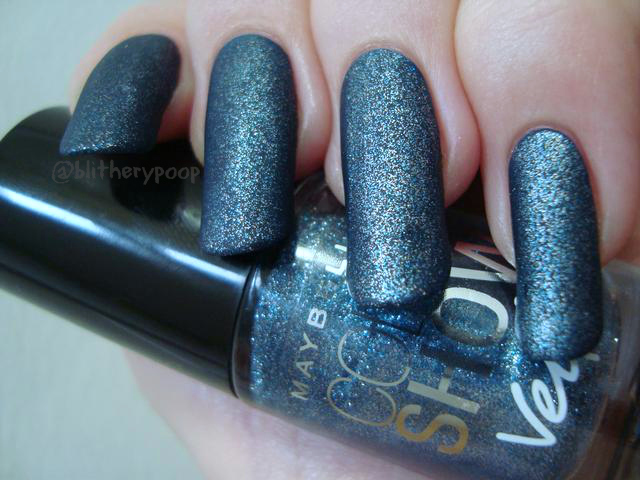 The matte microglitter is just a sprinkling instead of the usual static-y denseness. The gold shimmer really adds something too. I wanna try it over a darker blue sometime too. The application is good, though I did have to dab a bit to even out the glitter placement. I liked it glossy, but I like it even more matte! Crystal Disguise has fine, dense shimmer in blue, green, gold, and fuchsia. I have a sneaking suspicion that Crystal Disguise might be dupey for the original NYC Shimmer Blast. I'll be comparing them soon to find out. If it is, that's good news to anyone pining for that long-gone LE. The application is very good, smooth and even. Dupe or not, it looks just as awesome mattified as Shimmer Blast does. Blue Glaze has ultra-fine blue and silver glitter. How did I almost pass this up!? I think Blue Glaze might be my favorite of the four. It's beautiful! This is one easy coat. The result with matte topcoat is almost metallic. I want this in like six more colors! Ten even! Amethyst Aura has tiny purple microglitter and small periwinkle hexagonal glitter. I can't decide if Amethyst Aura is blue or purple. It's kinda soft...blurpiwinkle? Is that a thing? Whatever you wanna call it, it's pretty, though it doesn't catch my eye as much as the other three. I feel like it's less even than the others too. Am I nuts or is there more glitter on my pinkie than the other nails? This is one coat. The microglitter pops more when it's matte. Bottom line: They're all good, but I'm in complete love with Blue Glaze! 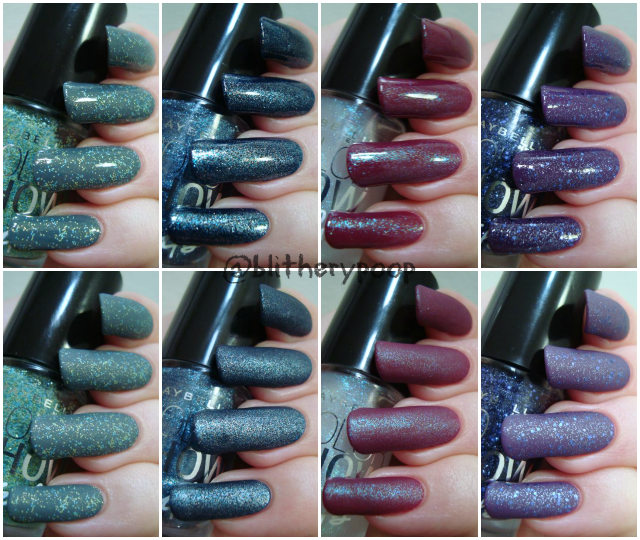 Teal Beam was a pleasant surprise, Crystal Disguise might be a dupe for NYC Shimmer Blast, and Amethyst Aura has more interest than the usual glitter topper. I like these enough that I might try Rose Mirage eventually too. Anyone know of other super tiny glitters like Blue Glaze? I feel like I have a couple in my stash, but I'd love to find more! Love seeing these matte--they look great that way! Blue Glaze is definitely my favourite as well!